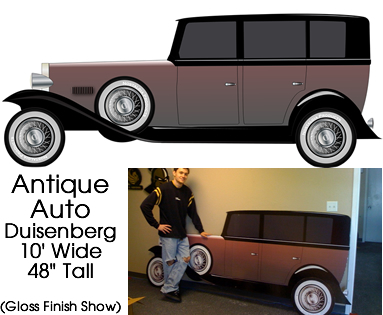 Duisenberg Classic Car Cardboard Cutout Standup Prop - Dino Rentos Studios, INC.
A classic auto of all time. Add some class to your display. Perfect to take pictures with. The auto cardboard prop can go with so many themes. Shown above with Gloss Laminate and Double thick cardboard options.